What do young superheroes do when they’ve blundered and bungled? They don’t get mad; they get SMART! 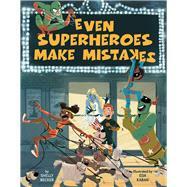 This fun follow-up to Even Superheroes Have Bad Days teaches kids another humorous lesson in overcoming adversity. Shelly Becker is the author of Sterling’s Even Superheroes Have Bad Days (a 2018 Blue Spruce Award Nominee), which Kirkus called “an action-packed romp,” and Mine! Mine! Mine!, which has been included in many top 5 and top 10 lists of books to teach the concept of sharing. In addition, Shelly is the author of more than 15 children’s novelty books. She lives in Toronto, Canada. Follow her @shellybeckerbooks. Eda Kaban was born and raised in Turkey and studied illustration in the US Her work has appeared in a wide variety of publications and her illustrations have been recognized by the Society of Illustrators, Creative Quarterly, American Illustration, and 3X3. She lives in Oakland, CA, with her husband. Follow her @petiteturk.